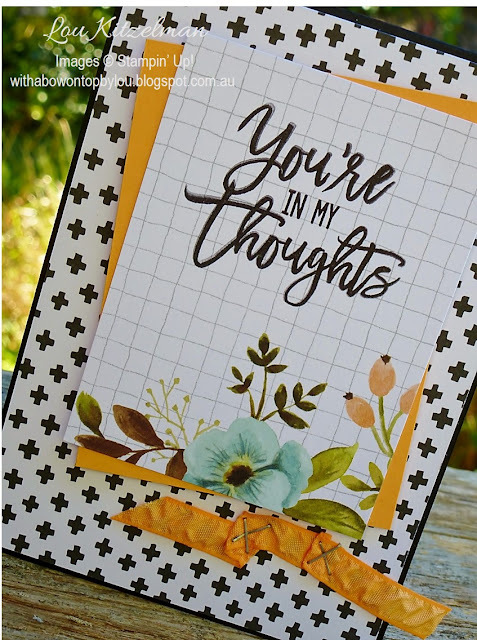 Do you ever need to make cards in a hurry but want them to look like they've taken ages to make? 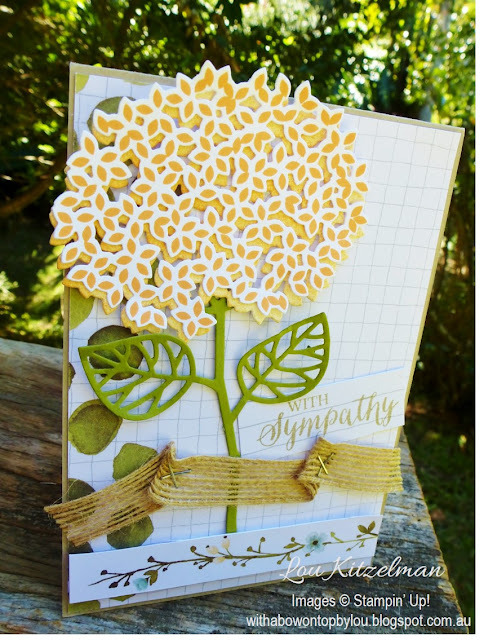 Using some of the Stampin' Up! 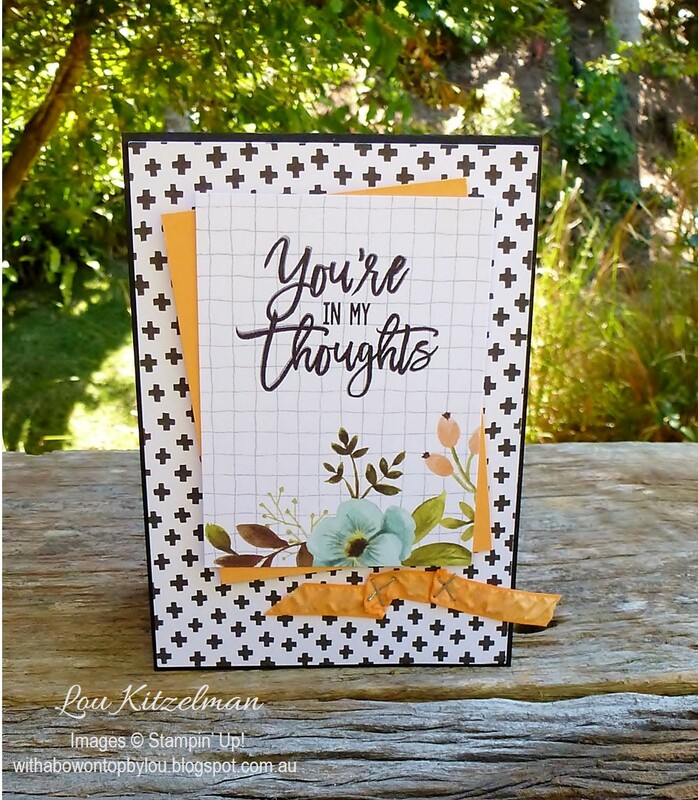 Project Life card collections might just be your answer. These are not just for memory keeping/scrapbooking. Each set works beautifully for cards and tags as well. Of course they are all colour coordinated so all you have to do is look in the catalogue to find out the colours used in the collection, grab your cardstock and ink and you are good to go. I go through the cards in the card collection like I am dealing blackjack to choose which ones to use! 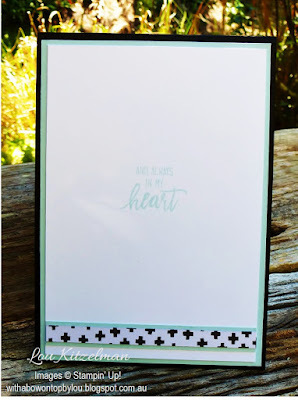 I needed to make 3 sympathy cards and also wanted to join one challenge this week so when I saw the challenge at Just Add Ink ..... Just Add....Project Life I knew I was set. 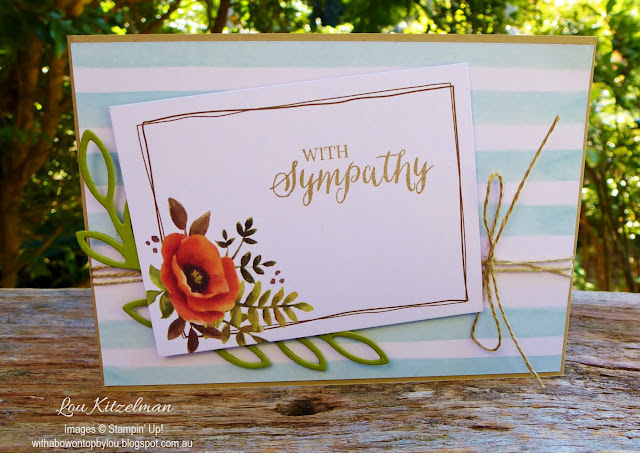 I have used the Hello Lovely collection and Thoughtful Branches and Rose Garden bundles to create 4 different sympathy cards without needing to get out too many supplies. (Sometimes I get too bogged down with too many ideas and run out of time to actually make the cards!) I know I said I needed 3 but as you get 2 cards bases from each A4 I decided to make 4! Such is life that you always need sympathy cards unfortunately. I love that the card collections have 3 different size cards in them so you can layer them for a quick yet effective layouts. And yes.....I am still addicted to my stapler. My friend commented to me recently how disparaging I was of her love of her stapler. But I completely take it back.......you absolutely NEED one! No taping ribbons and trim. Just staple away. The inside of each card uses offcuts from the front mats. This one just may be my favourite of the 4. I admit it is simple but sometimes.... less is more! And while the stapler is out why not add some of this beautiful burlap ribbon? This card started out one way and ended up another...hence the cut up bits at the bottom. Let's just say that the flower and I had creative differences....it didn't fit where or how I wanted it to! Don't have the Thoughtful Branches bundle yet? Well you only have a few days left to purchase this limited edition set. Order by August 31st to make sure you get this beautiful, versatile set.